According to the World Health Organization, malnutrition is the biggest contributor to child mortality, present in half of all cases. Six million children die of hunger every year. Underweight births and intrauterine growth restrictions cause 2.2 million child deaths a year. Poor or non-existent breastfeeding causes another 1.4 million. Other deficiencies, such as lack of vitamin A or zinc, for example, account for 1 million. Malnutrition in the first two years is irreversible. Malnourished children grow up with worse health and lower education achievement. Their own children tend to be smaller. Malnutrition was previously[when?] seen as something that exacerbates the problems of diseases such as measles, pneumonia and diarrhea, but malnutrition actually causes diseases, and can be fatal in its own right. ^ a b c d e f g h "An update of 'The Neglected Crisis of Undernutrition: Evidence for Action'" (PDF). www.gov.uk. Department for International Development. Oct 2012. Retrieved July 5, 2014. ^ a b c d e f g h i Bhutta, ZA; Das, JK; Rizvi, A; Gaffey, MF; Walker, N; Horton, S; Webb, P; Lartey, A; Black, RE; Lancet Nutrition Interventions Review, Group; Maternal and Child Nutrition Study, Group (Aug 3, 2013). "Evidence-based interventions for improvement of maternal and child nutrition: what can be done and at what cost?". Lancet. 382 (9890): 452–77. doi:10.1016/s0140-6736(13)60996-4. PMID 23746776. ^ a b Kastin DA, Buchman AL (2002). "Malnutrition and gastrointestinal disease". Curr Opin Clin Nutr Metab Care (Review). 5 (6): 699–706. doi:10.1097/01.mco.0000038815.16540.bc (inactive 2019-03-15). PMID 12394647. 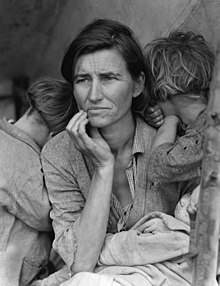 ^ a b c d e f "The State of Food Insecurity in the World 2018". Food and Agricultural Organization of the United Nations. Retrieved Jan 11, 2019. Cite error: Invalid <ref> tag; name "UNFAO2018" defined multiple times with different content (see the help page). ^ a b Murray, CJ (Dec 15, 2012). "Disability-adjusted life years (DALYs) for 291 diseases and injuries in 21 regions, 1990–2010: a systematic analysis for the Global Burden of Disease Study 2010". Lancet. 380 (9859): 2197–223. doi:10.1016/S0140-6736(12)61689-4. PMID 23245608. ^ "Malnutrition Kills Over 3 Million Children Annually Worldwide". Medical News Today. Retrieved 2018-02-20. ^ "Improving Social Security in Canada Guaranteed Annual Income: A Supplementary Paper". Government of Canada. 1994. Retrieved 30 November 2013. ^ "Environment – United Nations Population Division | Department of Economic and Social Affairs". www.un.org. Retrieved 2018-09-21. ^ "Family planning/Contraception". World Health Organization. Retrieved 2018-09-21. ^ a b Lessen, Rachelle; Kavanagh, Katherine (2015-03-01). "Position of the Academy of Nutrition and Dietetics: Promoting and Supporting Breastfeeding". Journal of the Academy of Nutrition and Dietetics. 115 (3): 444–49. doi:10.1016/j.jand.2014.12.014. ISSN 2212-2672. PMID 25721389. ^ a b c d e Balogun, Olukunmi Omobolanle; Dagvadorj, Amarjagal; Anigo, Kola Mathew; Ota, Erika; Sasaki, Satoshi (2015-10-01). "Factors influencing breastfeeding exclusivity during the first 6 months of life in developing countries: a quantitative and qualitative systematic review". Maternal & Child Nutrition. 11 (4): 433–51. doi:10.1111/mcn.12180. ISSN 1740-8709. PMID 25857205. ^ a b c Pugh, Linda C.; Milligan, Renee A.; Frick, Kevin D.; Spatz, Diane; Bronner, Yvonne (2002-06-01). "Breastfeeding Duration, Costs, and Benefits of a Support Program for Low-Income Breastfeeding Women". Birth. 29 (2): 95–100. doi:10.1046/j.1523-536X.2002.00169.x. ISSN 1523-536X. PMID 12000411. ^ a b c d e Cai, Xiaodong; Wardlaw, Tessa; Brown, David W. (2012-09-28). "Global trends in exclusive breastfeeding". International Breastfeeding Journal. 7 (1): 12. doi:10.1186/1746-4358-7-12. ISSN 1746-4358. PMC 3512504. PMID 23020813. ^ "The history of the SUN Movement". united nations. 2015. Retrieved 12 January 2019. ^ Sguassero, Y; de Onis, M; Bonotti, AM; Carroli, G (Jun 13, 2012). "Community-based supplementary feeding for promoting the growth of children under five years of age in low and middle income countries". The Cochrane Database of Systematic Reviews (6): CD005039. doi:10.1002/14651858.CD005039.pub3. PMID 22696347. ^ Lazzerini, M; Rubert, L; Pani, P (Jun 21, 2013). "Specially formulated foods for treating children with moderate acute malnutrition in low- and middle-income countries". The Cochrane Database of Systematic Reviews (6): CD009584. doi:10.1002/14651858.CD009584.pub2. PMID 23794237. ^ Schoonees, A; Lombard, M; Musekiwa, A; Nel, E; Volmink, J (Jun 6, 2013). "Ready-to-use therapeutic food for home-based treatment of severe acute malnutrition in children from six months to five years of age". The Cochrane Database of Systematic Reviews (6): CD009000. doi:10.1002/14651858.CD009000.pub2. PMID 23744450. ^ a b Viana Lde, A; Burgos, MG; Silva Rde, A (Jan–Mar 2012). "Refeeding syndrome: clinical and nutritional relevance". Arquivos Brasileiros de Cirurgia Digestiva : ABCD = Brazilian Archives of Digestive Surgery. 25 (1): 56–59. PMID 22569981. ^ Boateng, AA; Sriram, K; Meguid, MM; Crook, M (Feb 2010). "Refeeding syndrome: treatment considerations based on collective analysis of literature case reports". Nutrition (Burbank, Los Angeles County, Calif.). 26 (2): 156–67. doi:10.1016/j.nut.2009.11.017. PMID 20122539. ^ Victora, Cesar; Bryce, Jennifer (Jan 2000). "Reducing deaths from diarrhoea through oral rehydration therapy". Bulletin of the World Health Organization. 78 (10): 1246–55. doi:10.1590/S0042-96862000001000010 (inactive 2019-03-15). PMC 2560623. PMID 11100619. ^ "Global hunger worsening, warns UN". BBC (Europe). 14 October 2009. Retrieved 22 August 2010. ^ a b Joshua Ruxin (1996). "Hunger, Science, and Politics: FAO, WHO, and Unicef Nutrition Policies, 1945-1978" (PDF). University College London. Retrieved 12 January 2019. ^ "Universal Declaration of Human Rights". www.un.org. 2015-10-06. Retrieved 2018-02-24. 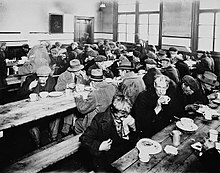 ^ "What is the Right to Food? | Right to food". www.righttofood.org. Retrieved 2018-02-24. ^ "Universal Declaration on the Eradication of Hunger and Malnutrition". Retrieved 2018-02-24. ^ "American Convention on Human Rights". www.hrcr.org. Retrieved 2018-03-17. ^ "Rome Declaration and Plan of Action". www.fao.org. Retrieved 2018-03-17. ^ Denis Campbell (14 October 2014). "Folic acid to be added to UK flour in effort to reduce birth defects". The Guardian. Retrieved 15 October 2018. ^ a b Milne, AC; Potter, J; Vivanti, A; Avenell, A (15 April 2009). "Protein and energy supplementation in elderly people at risk from malnutrition". The Cochrane Database of Systematic Reviews (2): CD003288. doi:10.1002/14651858.CD003288.pub3. PMID 19370584. 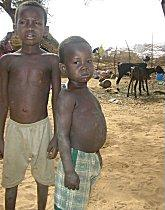 Look up malnutrition or undernutrition in Wiktionary, the free dictionary. 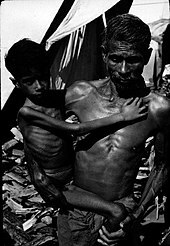 Wikimedia Commons has media related to Malnutrition.